At the east end of Rendezvous Bay there is an interesting little beach with an interesting relic of the past. I don't know who the "pirates" were or what happened to the original "pier", but the people who live in the neighborhood told me that the remains are called "Pirate's Pier", so who am I to question them. Between Cul De Sac and the Rendezvous Bay Hotel is a small beach that you might find fun, one of Anguilla's over 30 beaches. 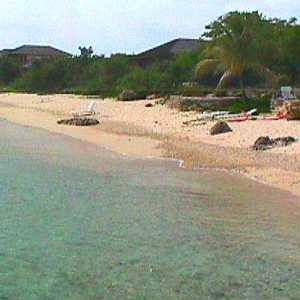 Residents who come down to the beach here say the snorkelling is great, and they can swim out into Rendezvous Bay. 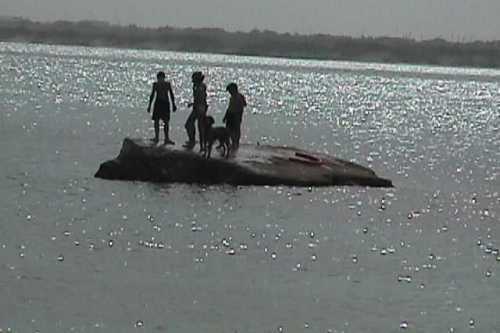 And the young at heart can swim out to the remains of the pier. The amount of sand on the beach varies with the latest big storms. 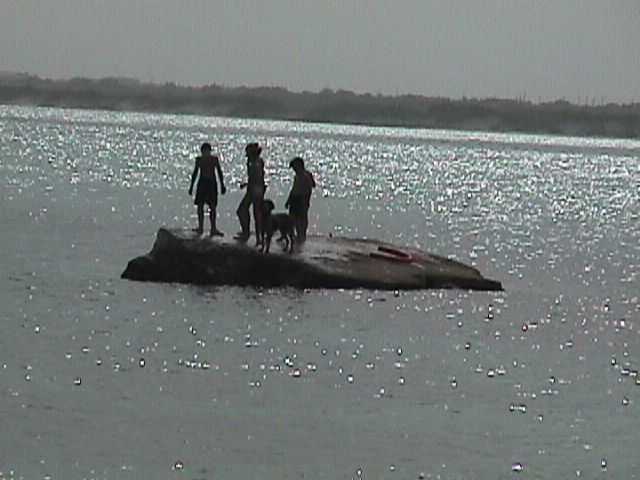 For more pictures of this beach and some children having fun on it, visit this web page. Directions: From the Blowing Point ferry terminal, take the first road to the west, go past the FerryBoat Inn, following the twists and turns into Cul De Sac. Turn right at the sign for Seahorse Resort on a gravel road and follow it to the sea. The road dead ends at the public beach access, with Seahorse just to the left. Remember, the beach is public, the the beach chairs are private! I just read your recent newsletter, and I cried... right there was a picture as big as day of 'my beach'. Rendezvous Bay, right there, Pirate's Pier. My husband and I visited Anguilla in June of last year for the first time, and definitely not the last (we are planning to return for our 10th anniversary in 3 years - a long time I know -- BooHoo) and we stayed at the Seahorse. I just can't tell you what your pictures did for me... I feel so overwhelmed by my urge to return to "Heaven on Earth". If you ever need pictures of that area again or any others, I have tons. Thank your for bringing me to a place that holds such a large part of my heart each month. Thanks for the updates over the last year or so. You do a very good job and the pictures are great. 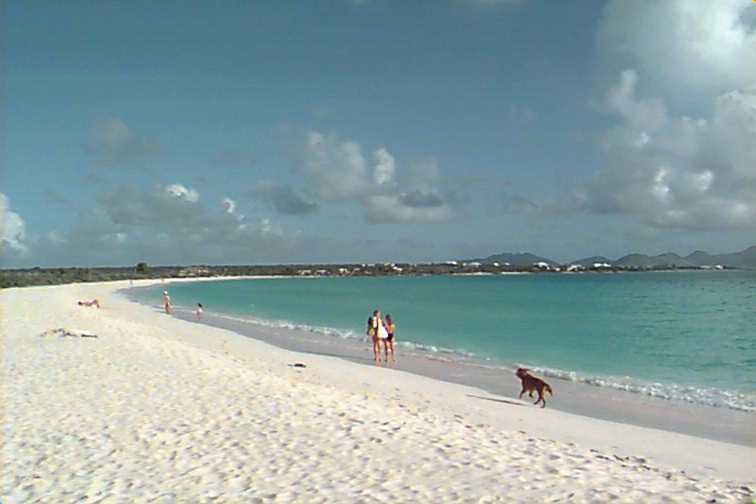 My wife and I are returning to Beautiful Anguilla in Feb. 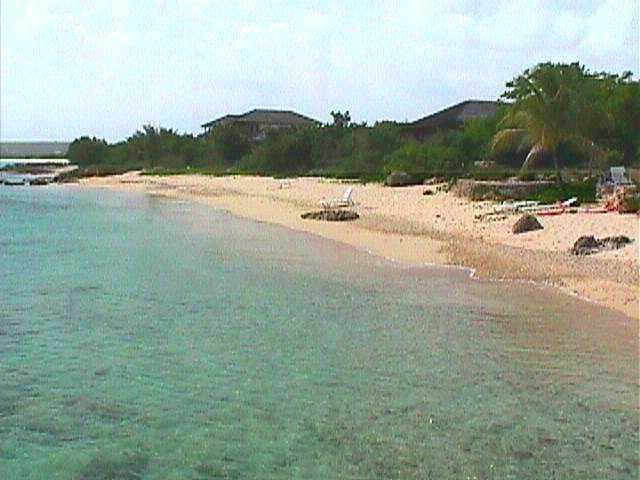 In fact this month you show the beach where we stayed last time at Seahorse. This time we are staying next door at Cedars Villa. We are both just counting the days. Thanks again for the wonderful job you do.